A presenter at a recent Marshall Space Flight Center award ceremony pointed out this fact as he introduced an award recipient who had worked on the International Space Station carbon dioxide removal assembly. Of course, breathing is important. But so is recycling, especially on the space station. You won’t do the first without the second. 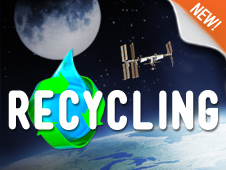 With our newest DIY Podcast module, Recycling, you and your students can use NASA content to create a podcast or other multimedia product with NASA video, audio clips and images to show the importance of recycling in a closed system. Space recycling is not the same as recycling aluminum, paper, plastic, etc., on Earth: Instead, this module is about recycling our most vital needs — air and water. The module includes sound bites from an interview with NASA microbiologist Monsi Roman (pronounced ro-MAHN). She worked on the Environmental Control and Life Support System for the space station from its inception and was able to see the finished product in use by the station crew. She is currently working on life support systems to sustain a crew on missions beyond Earth’s orbit. Roman explains the purpose of ECLSS, how it was tested and why it’s important. A couple of sound bites from astronaut Mike Fincke explain how the life support system removes carbon dioxide from the air and what happens to other space trash. We have a few clips from 2009 of the Expedition 19 station crew taking the inaugural drinks of recycled water. The animation clips in this module illustrate the chemical processes that occur as the ECLSS recycles. In all, we have 23 video clips, 16 audio clips and 16 images to start you on the road to Recycling.